What A Difference A Dog Book Can Make. Doug Koktavy, author of the award-winning book, The Legacy of Beezer and Boomer is making several stops in Florida this weekend. The New Barker dog magazine and TradeWinds Island Resorts on St. Pete Beach have partnered with several retailers to provide Doug with a venue in Sarasota, Apopka, Clearwater and Tampa. 50% of the book sales will be going to various rescue groups in Florida as a result. “Our goal is to sell 100 books and raise around $1,000 for each venue’s rescue group,” said Anna Cooke, editor of The New Barker. And if Thanksgiving travel plans have you out-of-town during this five-day event, you can still purchase your book and have it signed by the author. The owners of each of the businesses hosting the events will hold onto your signed copy until you return. 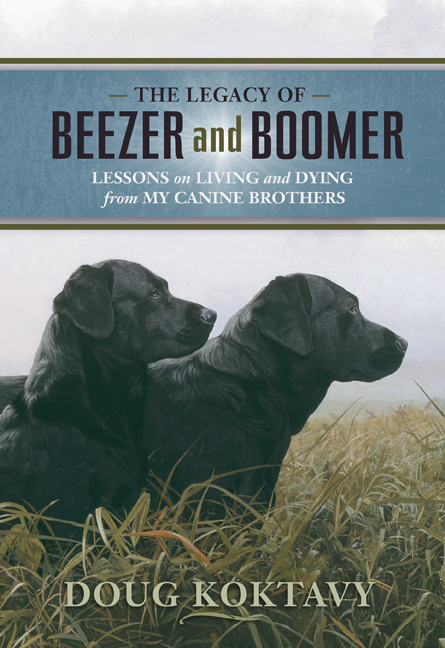 If you are a dog lover or know someone who is, The Legacy of Beezer and Boomer will make a thoughtful holiday gift, personally inscribed by the author. Beautifully illustrated by artist Chris Smith, the book is a gift that gives twice, knowing that 50% of the purchase price will be going to a Florida rescue group. Doug’s beautiful Black Labradors, Beezer and Boomer both had terminal illnesses, but they left behind a legacy of amazing lessons. Doug wants pet owners to know that while you may be saying goodbye to your furry or feathered family member, these are not the worst of times, but the best. The book is much more moving and inspirational than it is sad. In fact, it was bestowed the prestigious Nautilus Book Award in April, 2010. The book is in good company with other Nautilus Book Award winners, including Deepak Chopra, MD and His Holiness the Dalai Lama. Anyone living with companion pets should have a copy of this book in their library to refer back to from time to time. There are wonderful life lessons on the pages, things that one can put to use daily, in all relationships. The reception at Wet Noses will be from 5:30pm until 7pm. Wine and hors d’oeuvres will be served. A $5 donation is requested which will go towards the purchase of the book. Doug will be signing books, and 50% of the proceeds will be going to the Humane Society of Sarasota County. On Saturday, Doug will then be at Media on Main in Downtown Sarasota from 10am until noon. He will give a presentation along with Bentley’s House, a local pet grief counseling group. This will be another Sarasota opportunity to get up close and personal with the author, have your book signed and again – 50% of the book sales will go to the Humane Society of Sarasota County. Contact Chris Baer at Wet Noses to reserve a copy of the book for either Friday’s or Saturday’s event. 941.388.DOGS (3647). 50% of book sales will go to the C.A.R.E. Foundation. “One thousand dollars will provide a new roof for the pen area, housing four dogs, two goats, a pig and a tortoise,” said Christin Burford, Executive Director of the C.A.R.E. Foundation. “Each of these rescued animals works hand-in-hand with autistic children,” she added. Currently, the roof is a torn tarp. 50% of book sales will go to Labrador Retriever Rescue of Florida. “One thousand dollars will treat five dogs for heartworms and provide annual shots for 20 dogs waiting to be adopted,” said Lise Amundrud, a volunteer with Labrador Retriever Rescue of Florida. “We have more than 120 Labs in foster care right now and spend on the average, $450 per dog in medical costs. So, $1,000 will help offset our high medical expenses,” she added. 50% of book sales will go to TampaPets.org, a partnership between Hillsborough County Animal Services, Humane Society of Tampa Bay and about 60 rescue groups. “One thousand dollars will go towards the 2011 Tampa Pet Adoption Expo Fund to ensure the expos will continue to remain free to rescue groups participating,” said Cory Cooper, board president of TampaPets.org. Doug Koktavy is an attorney and now Certified Counselor, Association for Pet Loss and Bereavement. If you or someone you know has lost a pet or going through a pet’s terminal illness, come hear Doug talk. It could be the single, most inspirational thing you do all holiday season.